I know in some areas of the country Fall is still a long way off, but we're starting to see the slightest signs of it here. 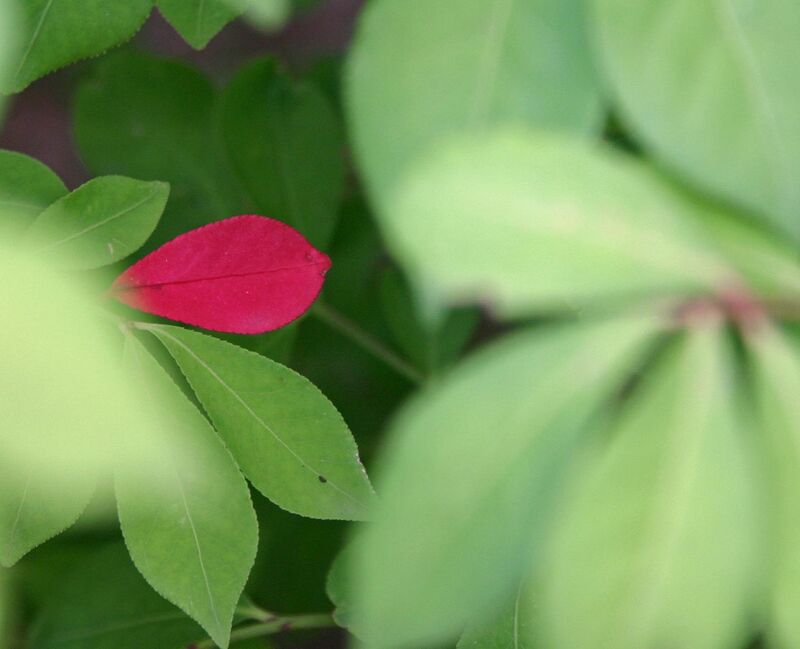 I spotted this red leaf hiding in the bushes the other day. We have just a few leaves on the ground so far but unfortunately the colors are dull because we've had too much rain all summer. Beautifully simple, Beki, yet it says it all. What a good catch on your part to notice. :) Hope all is well. awesome pic. great capture! Thanks for sharing. Fall is a beautiful time. That little leaf is so cute. Wonderful contrast in the leaves. Almost looks Christmasy! Love this time of year, when God repaints the leaves. I dont see Mr Linky, so here is mine. I have been thinking all week of using Autumn for my fingerprint friday, you beat me to it LOL! Is that a leaf from a burning bush? I had one when we lived in Michigan and I miss it so much in the fall! Hi Beki. Thanks for stopping by. I hope you have a great weekend! I love this! What a great thing...maybe I will do it next week. Your blog is so sweet...love it. I get inspired by fall all year.